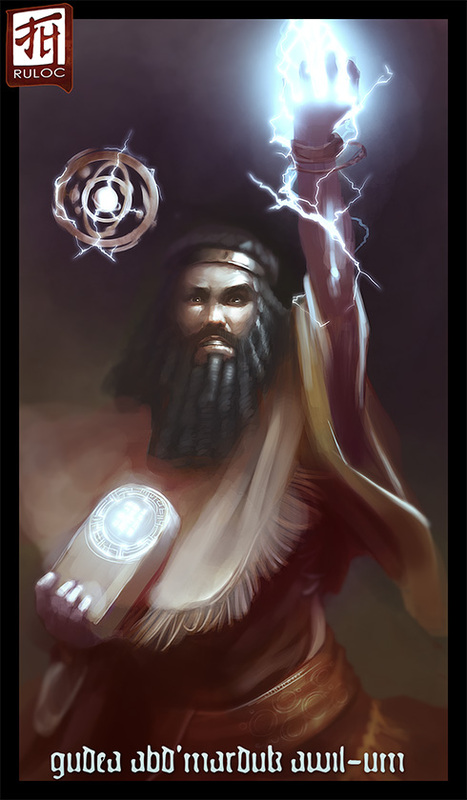 Held in accidental magical stasis for millenia before his release, Gudea is one of the ancient priests of Marduk, the first men to master the art of wizardry at the dawn of history. He stil dresses in the archaic and ornate red, gold and orange regalia of the ancient priesthood of Marduk, complete with a prodigious tightly curled black beard and hairdo spilling to his shoulders and down his chest. As he is basically from the bronze age, his spellbook is in the form of a trunk full of cuneiform tablets. His familiar is a Harbinger Archon made of bronze rings and crystal shards whirling in an intricate pattern.